At the intersection of comfort and convenience, Courtyard Little Rock West hotel provides a prime centralized location just minutes from numerous great shopping and dining locations. Visit nearby UAMS, Arkansas Children's Hospital and Baptist Hospital. Enjoy events at Verizon Arena and War Memorial Stadium only minutes away. Our hotel is a quick commute from Little Rock Zoo, Pinnacle Mountain State Park, UALR, and the State Capital. 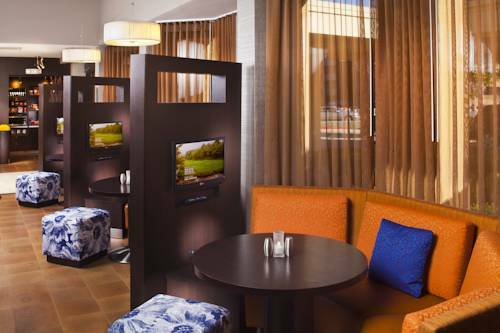 Following a day of family fun or business meetings, make yourself at home in a spacious West Little Rock hotel room or suite with Wi-Fi, a flat-panel TV and plush bedding. Then grab a bite to eat at The Bistro, our casual eatery offering a wide selection of meals, plus Starbucks beverages and nightly cocktails. Enjoy our on-site fitness center and unwind at our seasonal outdoor pool. For small meetings or social events, reserve one of our great meeting spaces. The friendly staff at Courtyard Little Rock West is here to help you capitalize on comfort for your upcoming trip.